The story behind Mark Twain and the underage "angelfish' he collected. The disturbing story behind Mark Twain and the underage "angelfish" he collected. Mark Twain, whose real name was Samuel Clemens, was one of the world’s most influential writers. His books, including The Adventures of Huckleberry Finn, continue to be studied in high school classrooms and university lecture halls all over the world. But Mark Twain the man was a little bit… odd. According to The Paris Review, the author developed a rather strange habit when he turned 70. The Tom Sawyer writer began “collecting” young, underage girls who he referred to as his “angelfish”. He publicly defended the move, telling people who asked that he just longed for his own grandchildren. His daughters were grown up by then and his favourite daughter, Susy, had already passed away. It all began when a 15-year-old girl named Gertrude Natkin saw Twain leaving Carnegie Hall on December 27, 1905, after a matinee performance. The teenager went up and spoke to the famous author and shook his hand. The next day she sent him a thank you letter. Twain replied, calling himself Gertrude’s “oldest and latest conquest”, and they continued to exchange flirty letters until Gertrude turned 16 and Twain turned his attention to younger girls. By 1908, Twain had “collected” 10 schoolgirls who he referred to as his “angelfish”. He gave them membership to his “Aquarium Club” and had enamel lapel pins designed for them to wear on their left breasts – just above their hearts. Twain spent large amounts of time writing letters to his angelfish and inviting them to spend time at his mansion in Redding, Connecticut. “I have built this house largely, indeed almost chiefly, for the comfort & accommodation of the Aquarium,” he said in a document he sent to the angelfish. 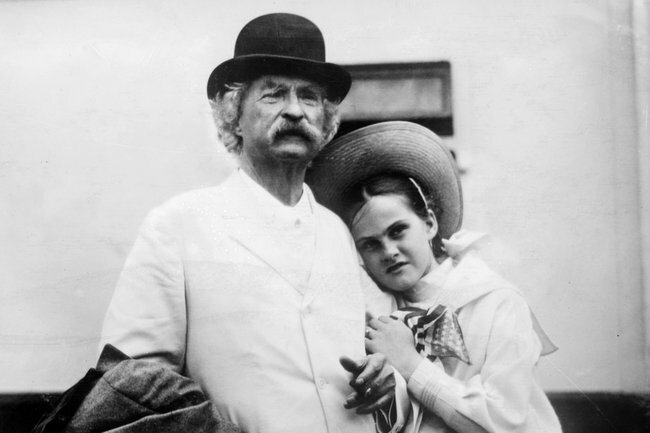 On a ship returning from a trip to England, Twain befriended a nine-year-old girl named Dorothy Quick (pictured above). The pair were inseparable throughout the trip, and Dorothy was often spotted with her head resting against Twain’s shoulder. Later that year Twain’s daughter, Clara, returned from a European concert tour and put an end to her father’s new obsession. She renamed the house Stormfield and stopped the angelfish from visiting. Just two years later, in 1910, Twain died of a heart attack. He went on to be regarded as one of the most brilliant literary minds and his obsession with adolescent girls was rarely mentioned.